My school family at Central Elementary has been blessed to serve as a model school for Jon Gordon’s The Energy Bus for Schools Leadership Journey, led by Niki Spears. I read The Energy Bus, by Jon Gordon many years ago, and it changed my entire mindset. I am thankful for a school family who has embraced the ten rules for the ride of your life, and model them daily for our kids. We lead and serve each day in education, and I choose to lead with JOY. 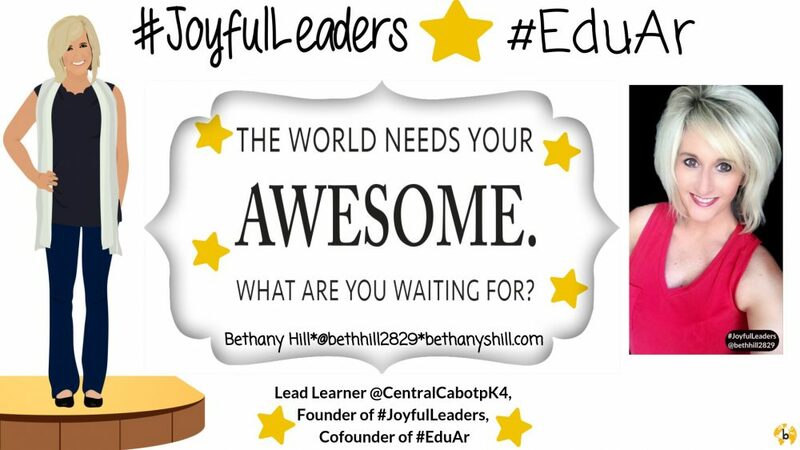 The hashtag #JoyfulLeaders is born upon the publishing of this post. Along with what I hope becomes a widespread joy movement, comes 10 traits of #JoyfulLeaders. There are so many more, but these are the 10 that I hold close and try to live out each day. Always look for ways to share joy with others. Seek out people with an empathetic heart. Keep love at the center of the organization in which they belong. #JoyfulLeaders have the capacity to build other #JoyfulLeaders, and the ripple effect begins with YOU. We are all leaders where we serve. I serve kids, and I do so with JOY in my heart. Whatever you do, and wherever you lead, do it with joy…be a #JoyfulLeader and make your mark on the world, while inspiring others to do the same. Find your JOY, and never stop sharing it with the world. A special thanks to Jon Gordon for continually inspiring, and for his Chief Energy Officer, Niki Spears for her support with becoming an Energy Bus School. They are both true examples of #JoyfulLeaders. This entry was posted in Edcucation, education, Empathy, Leadership, learning environment, Relationships, School Administration, school culture. Bookmark the permalink. I will be following this hashtag closely. Thank you. Excellent post!! I am glad #joyfulleaders is going strong. You have inspired me!! Thank you for being a contributor! It has been an honor to connect!